CharityChoice Gift Cards …when meaningful matters. 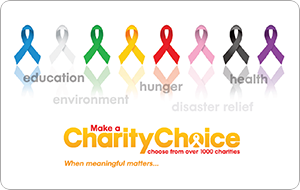 Support the greater good by choosing CharityChoice donation gift cards. You may designate the funds for up to three charities of your choice, exclusively from our online list of over 250 major charities and many local causes, totaling over 1000 in all. The online designation is an easy and very rewarding experience with something meaningful for everyone. Follow the easy instructions on the back of the card to donate the funds. Learn about the charities at our website. Follow links to the various charities' websites for more information to assist in making your decision. For more information and a complete list of the charities available for selection, visit www.charitygiftcertificates.org.